YJ: How long have you been studying Chinese? 你学汉语多长时间了(ni3 xue2 han4 yu3 duo1 chang2 shi2 jian1 le)? 你 ni3 means you. 学 Xue2, second tone, means to study. And 汉语Han4 yu3 means Chinese language. Cam: So 学汉语 xue2 han4 yu3 means to study Chinese. YJ: Good. And多长 (duo1 chang2) means how long. YJ: Right. duo1 chang2 is a general term that can be applied to either length or duration. Here we can say 多长时间(duo1 chang2 shi2 jian1), literally means how long time. 时间(shi2 jian1), time. Cam: 多长时间 duo1 chang2 shi2 jian1, how long. YJ: Correct. Put all phrases together, 你学汉语多长时间了 ni3 xue2 han4 yu3 duo1 chang2 shi2 jian1 le? How long have you been studying Chinese? Remember, the ending 了(le) is a particle word, meaning the completion of an action. Cam: ni3 xue2 han4 yu3 duo1 chang2 shi2 jian1 le? Cam: Actually I've been studying Chinese for a year. I know a year is 一年 yi4 nian2. Can I give my answer by replacing "多长时间 duo1 chang2 shi2 jian1" with 一年 yi4 nian2? This would be "我学汉语一年了 Wo3 xue2 han4 yu3 yi4 nian2 le". YJ: very good, Cam! But usually we'd like to put in some adverbs in front. For instance: 已经(yi3 jing1) means already. yi3, the third tone, and jing1, first tone. YJ: and there is another adverb for you to choose from. It's 才(cai2) ,second tone, means only. 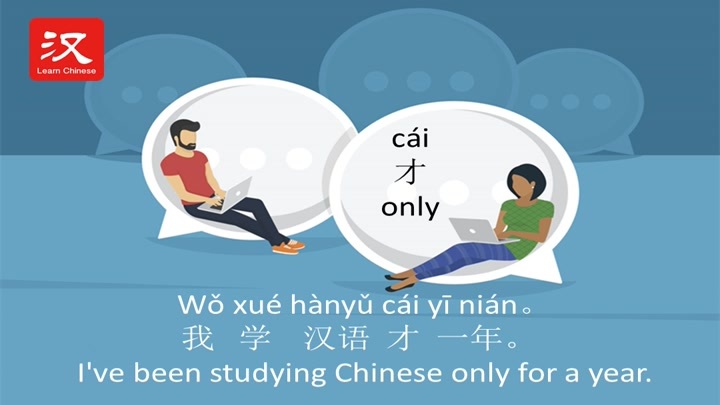 So when you want to say “I've been studying Chinese only for a year.” then you can say "我学汉语才一年 Wo3 xue2 han4 yu3 cai2 yi4 nian2". Cam: Wo3 xue2 han4 yu3 cai2 yi4 nian2. But YJ, where is the particle word "了le"? YJ: Good question. Actually here le can't be used together with才(cai2) which means "only". So it's Wo3 xue2 han4 yu3 cai2 yi4 nian2. I've been studying Chinese only for a year. Cam: Wo3 xue2 han4 yu3 cai2 yi4 nian2. Cam: YJ, there is another question I often heard – how long have you been in Beijing? Can I use the sentence pattern we've just learned ? YJ: Surely you can. You just need to replace xue2 han4 yu3 with lai2 bei3 jing1. "来北京(lai2 bei3 jing1)" means to "be in Beijing". YJ: So the question would be: 你来北京多长时间了(ni3 lai2 bei3 jing1 duo1 chang2 shi2 jian1 le)?How long have you been in Beijing? Cam: ni3 lai2 bei3 jing1 duo1 chang2 shi2 jian1 le?